When Jason Fried and David Heinemeier Hansson announce their new book… well, I directly hit the (Pre) Order button! 😀 They’re on a handful list of authors whom I trust and I’ll always buy their books the minute they’re announced, overriding my usual system for filtering what I read. I highly admire what they built with Basecamp, the company they founded two decades ago, and been following their work for a long time. With the risk of sounding like a crazy obsessed fan right now, I admit I’ve read all their blog posts, tweets, listened to all interviews they gave, and, obviously, read and recommended their previous books, Rework and Remote (by the way, they should be on your must-read list). The idea of questioning everything before doing it in a certain way just because everyone’s doing it like that – from big things, such as taking money from investors, having an office or keeping your business at a small level, to day-to-day things, such as recurrent meetings, being always connected to email or various instant messaging platforms. Their approach for building a boostrapped, profitable and healthy business that will survive over the long-term. The importance of putting their team, the people they work with every day, above all. They make sure they provide them with the best opportunities for them to learn and thrive. They keep a calm environment, where their people aren’t rushed, stressed, tired or wasting time on unnecessary distractions – things that affect their efficiency. A focus on what’s meaningful instead of just signaling. The “no-bloat or fluff” philosophy also applies to their books – they cut out all the unnecessary words, making sure they leave just the meaningful and practical core. How many times have you read business books that were repetitive and should have been long articles, right? 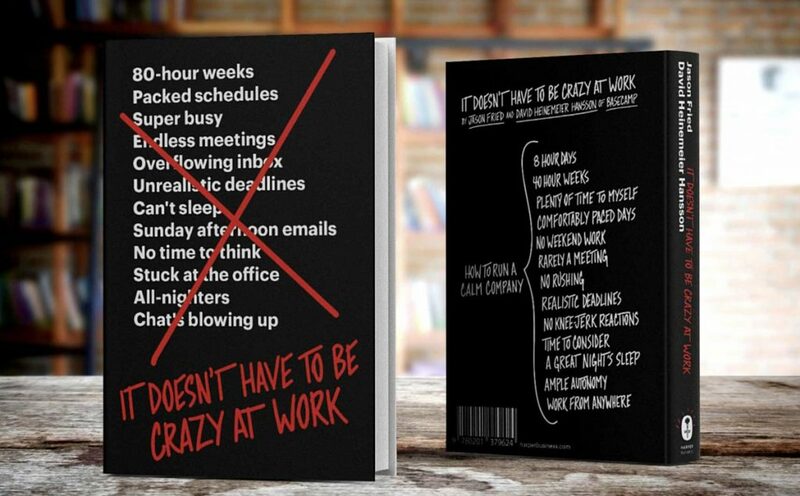 Their new book is called “It Doesn’t Have to Be Crazy at Work” and was launched yesterday. “It’s crazy at work” – this is a phrase that I’ve heard ooooh, too many times. And I’m guilty of complaining about it myself or just thinking it, without expressing. In the new book they talk about “the calm company” – an approach that attacks the long working hours, aggressive “hustle and grind” (geez, I’m sick of hearing these terms), excessive workload, chaos and anxiety that became the norm for almost all workplaces. Hopefully, by now I convinced you to order “It Doesn’t Have to be Crazy at Work” today. I’m still waiting for Amazon to deliver my copy, I’ll be back with an update afterwards. P.S. if you’re curious to learn what books they personally read and recommend, check them out here and here.